There is a subtle, mysterious poetry that emanates from Erich Hartmann’s photography, a play of shadow and light that is captivating yet respectful. Hartmann embraced places, objects, and people with his camera, never unsettling the moment, always capturing it in a way that allowed it to be rediscovered. The Poetry of Daily Life exhibition features 27 images by Hartmann that magnify the glory of the ordinary and the dignity of the routine. The photographs on display are all vintage prints that have the unique quality of being developed by Hartmann’s own hand. This year, which marks the 20th anniversary of Erich Hartmann’s death, will be a momentous year for his work as there will also be two major museum exhibitions consecrated to the legendary photographer: in Basel, Switzerland from March to July 2019 as part of a collective exhibition Isrealities; and then in November 2019, his Irish portfolio will be exhibited at the National Gallery of Ireland in Dublin. 21 March 2019 to 4 May 2019. 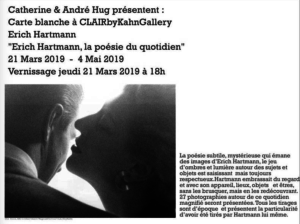 Vernissage Thursday 21 March 2019 at 6pm.